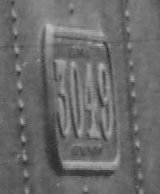 Taken 25 Sep 1955, "LMS 58860", and "LMS 58856"
Just climbed Hopton Incline, LNWR 2-4-0 tank loco number 3049, designed by Francis Trevithick and Allan, converted from No 67 "Briareus" Photo taken between June 1889 (when it was numbered 3049) and June 1894 (when it was scrapped). Notice the later enclosed cab and the Midland Rail 3-axle tender. 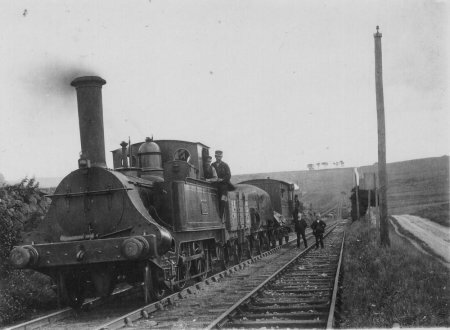 This class was much used on the CHPR at the time. The train is on the 'downhill' line, the 'uphill' line is apparantly out of use. 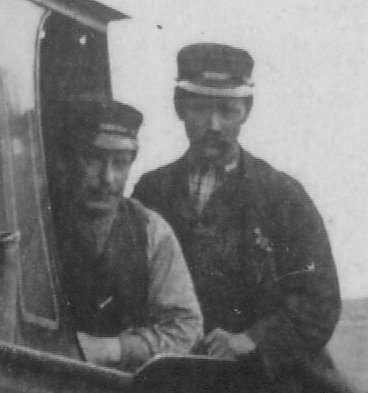 Driver and stationmaster, who are they? 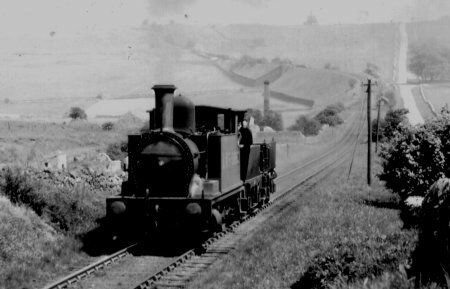 Hopton Incline on the CHPR. 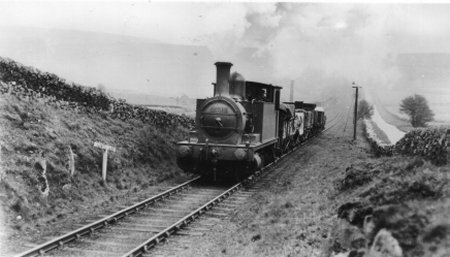 Hopton Incline, a 1 in 14 section of the Cromford and High Peak railway near Hopton. 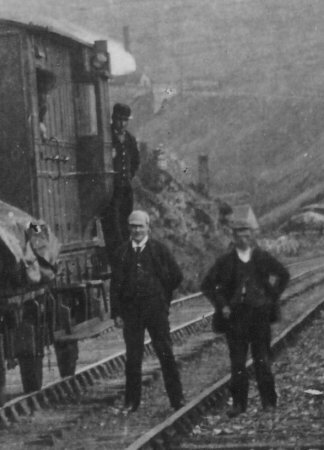 This incline, originally an inclined plane operated by rope haulage, was the steepest gradient worked by adhesion in Britain. The severe change of gradient can be seen at the foot. 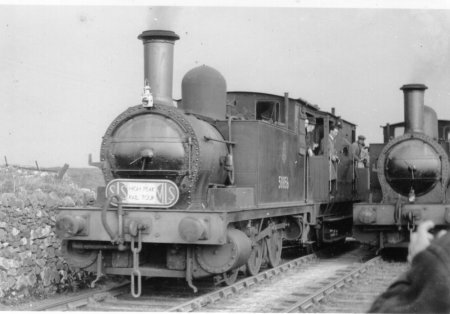 Below is a 'Crewe Goods' LNWR 2-4-0T, taken about 1890. The enclosed cab recognises the severe weather here on the Moors! 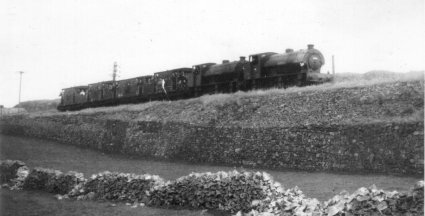 Here an 0-6-0T No 7527 climbs the start of the incline under full pressure, on 4 May 1934 pulling 6 trucks. 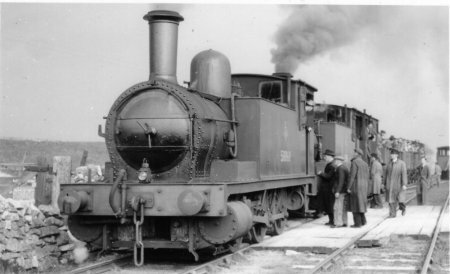 The loco was designed in 1924, from a Midland design, steam pressure 160 lb, tractive effort 20,835 lbs, graded 3F, originally a North London Rail design, then Midland Rail, then L.M.S, finally B.R. 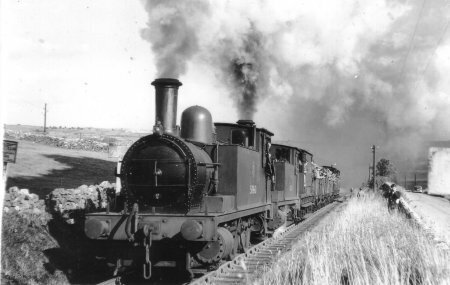 A sign of the times, on 25 Sep 1955, 58860 and 58856 double-heading at the top of Hopton Incline, pulling 4 wagons full of enthusiasts on an Ian Allan High Peak Rail tour. The shed number is 17D (Rowsley). Taken 1967. 4 guardsvans packed with happy enthusiasts on the last day on the CHPR. J94 68006 and 68012, 0-6-0 and 4F, ex MoS. The steepness of the incline is well shown. Taken 1953 Apr 25 at Hopton Top. 58856 (left) and 58860 (right) with enthusists on "High Peak Rail Tour" organised by Stephenson Locomotive Society and Manchester L.S.